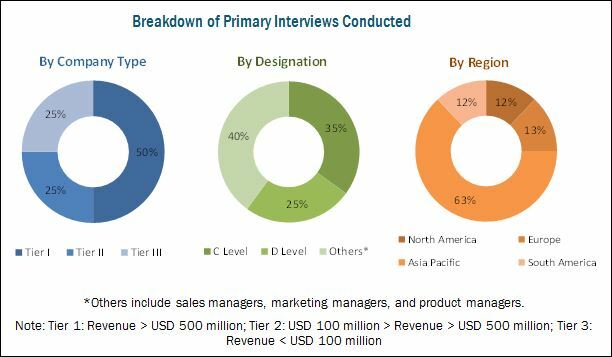 [156 Pages Report] Dairy Testing Market report categorizes the global market by Type (Safety (Pathogens, Adulterants, Pesticides), Quality), Technology (Traditional, Rapid), Product (Milk & Milk Powder, Cheese, Butter & Spreads, Infant Foods, Ice Cream & Desserts, Yogurt), and Region. The dairy testing market was valued at USD 3.86 Billion in 2016 and is projected to reach 5.90 Billion by 2022, at a CAGR of 7.4% during the forecast period. The increase in outbreaks of foodborne illnesses, globalization of dairy trade, and stringent safety & quality regulations for food are the factors driving this market. The key players have been identified through secondary sources such as the Food & Drug Administration (FDA), the United States Department of Agriculture (USDA), and the Canadian Food Inspection Agency (CFIA), while their market share in respective regions has been determined through both, primary and secondary research. The research methodology includes the study of annual and financial reports of top market players, as well as interviews with industry experts (such as CEOs, VPs, directors, and marketing executives) for key insights (both quantitative and qualitative) for the dairy testing market. The various contributors involved in the value chain of the dairy testing market include raw material suppliers, R&D institutes, dairy testing service providing companies as SGS, Bureau Veritas, Intertek, Eurofins, dairy testing equipment manufacturing companies, and government bodies & regulatory associations such as the United States Department of Agriculture (USDA), the Food and Drug Administration (FDA), and the European Food Safety Authority (EFSA). This research report categorizes the dairy testing market based on type, technology, product, and region. The dairy testing market is estimated to be valued at USD 4.13 Billion in 2017 and is projected to reach USD 5.90 Billion by 2022, at a CAGR of 7.4% from 2017. The market is driven by the increase in outbreaks of foodborne illnesses, globalization of dairy trade, and stringent safety & quality regulations for food. The dairy testing market, based on type, has been segmented into safety testing & quality analysis. The safety testing segment dominated this market in 2016 and is also projected to be fastest-growing during the forecast period. This is attributable to the significant emphasis being laid on safety testing of food output with regulatory authorities focusing on addressing regulatory loopholes, preventing adulteration, malpractices, and labeling mandates. The dairy testing market, by technology, has been segmented into traditional and rapid. The rapid technology segment dominated the market in 2016 and is projected to be the fastest growing by 2022. Low turnaround time, higher accuracy, sensitivity, and the ability to test a wide range of contaminants in comparison to traditional technology are the reasons for the growth of the rapid technology segment. The dairy testing market, by product, has been segmented into milk & milk powder, cheese butter & spreads, infant food, ice cream & desserts, yoghurt, and others. The milk & milk powder dominated the market in 2016 and is projected to be the fastest growing by 2022. This is due to economically motivated adulteration, poor hygiene of storage, faulty supply chains, and contaminated equipment, which have led to milk being contaminated, which upon consumption can cause serious health problems to humans. Europe accounted for the largest market share in the dairy testing market. The dominant share of the European region is attributed to the stringency of food safety regulations and laws pertaining to nutritional content and labeling here. It has the highest number of testing laboratories among all regions and tests the most number of dairy samples. Asia Pacific is projected to be the fastest-growing region during the forecast period due to the presence of major dairy producing countries such as China, Australia & New Zealand, and India as these countries are becoming more aware of food safety and are implementing testing regulations. Lack of coordination between market stakeholders and inefficient enforcement of regulatory laws & supporting infrastructure in developing economies are the major restraints for this market. 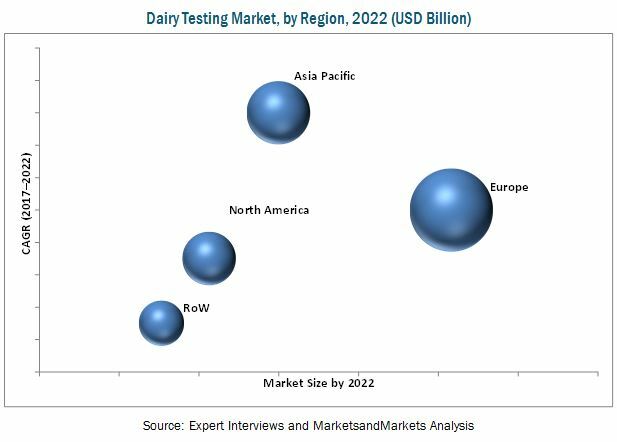 The global market for dairy testing is dominated by large-scale players such as SGS, Bureau Veritas, Intertek, Eurofins, TÜV SÜD, TÜV NORD GROUP, and ALS Limited. Neogen Corporation, AsureQuality, Mérieux NutriSciences, Microbac Laboratories, and Romer Labs are a few other key market players that also have a significant share in the dairy testing market. *Details on Business overview, Service offering scorecard, Services offered, Business strategy excellence & Recent developments might not be captured in case of unlisted companies.